I don't know about you, maybe it is because I'm English, but have you found that just about everyone in America will stand there and tell you that American beer is no good and then offer you a can of Bud or Coors? Then they tell you stories of trips to Europe and how good the beer is there with some even having been to Octoberfest! Let me say this: I don't know about Bud, but Coors is quite a good beer in England if you like Larger type beers rather than Real Ale (beer that you drink at room temperature & a whole different story) like I do. A nice pint of Coors Extra Gold is a great drink! So the facts seem to indicate that something is just wrong with the taste of American (or Canadian) beer when it is in America? The only explanation to this that I can think of is that little Federal Logo on all canned and bottled beers in America from the FDA. Get your imported beer by the keg! There appear to be many imported beers available in the United States and as far as I can see, all the ones I have tried are untouched by the dreaded FDA (assuming that is indeed the problem). 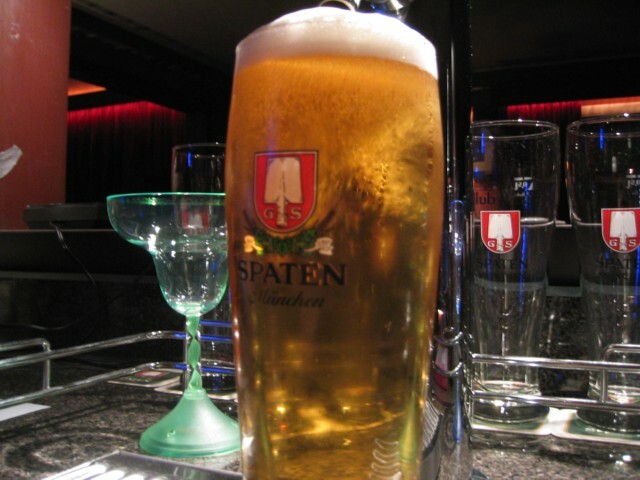 The best example that I have found is Spaten Larger which is lucky because it is my favorite beer! Unbelievably I had to come to America to find this particular fine German beer! I found it at a German restaurant & Bar in Maryland called The Old Stein Inn. This place was just across the road from the Mayo Ridge Marina in Edgewater where we used to stay in our motorhome at the weekend while boating during 2001. They have great food there and a fantastic selection of German beers! 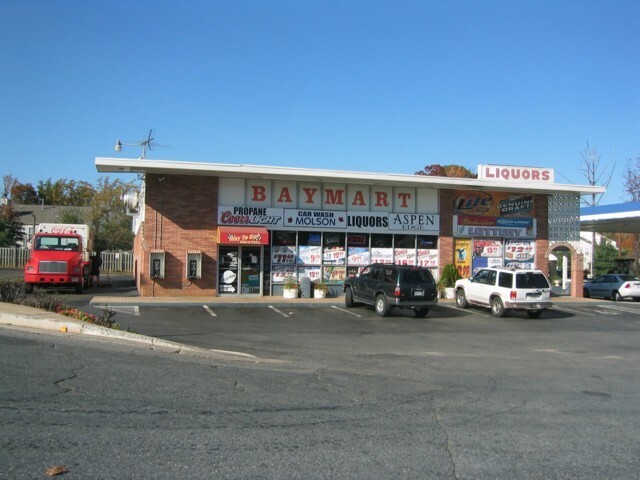 I have found that I can buy the beer kegs from Baymart in Annapolis (410) 757 5926, just over the Bay Bridge from here. 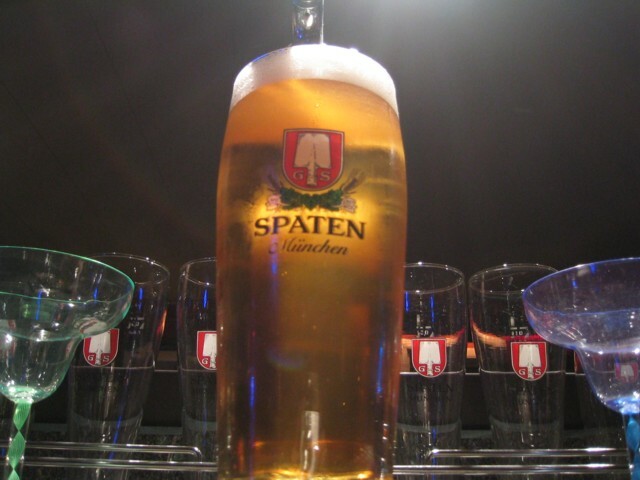 A half keg of Spaten costs about $129.95, so that's about $1.45 a pint! 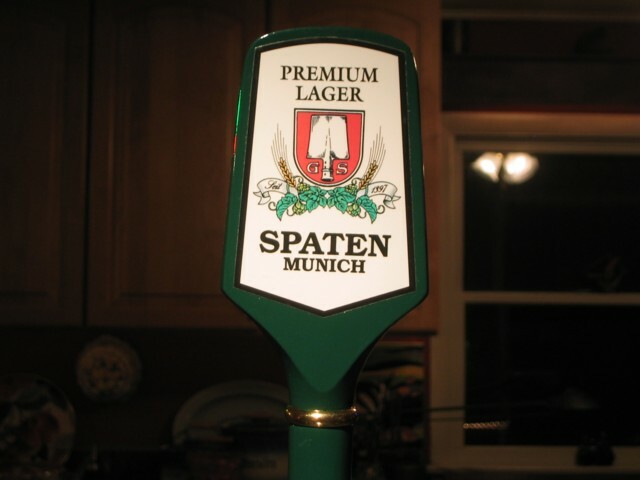 In Maryland, Spaten is distributed by DM Distributing Co. in Pasadena. 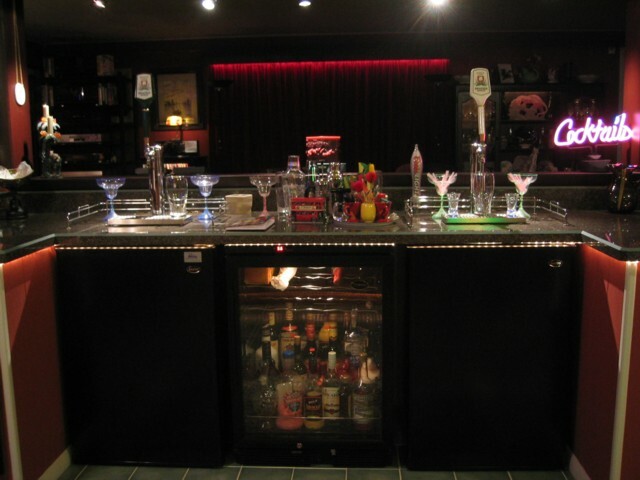 You can call them at (410) 437 0900 to find the nearest liquor store that they deliver to. 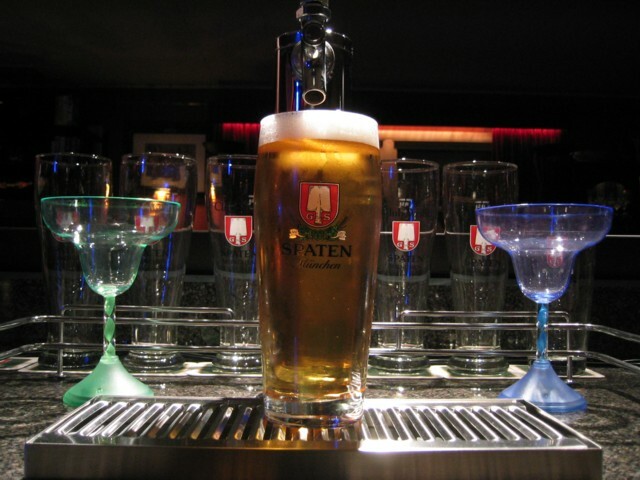 For other states, you can checkout the Spaten web site. 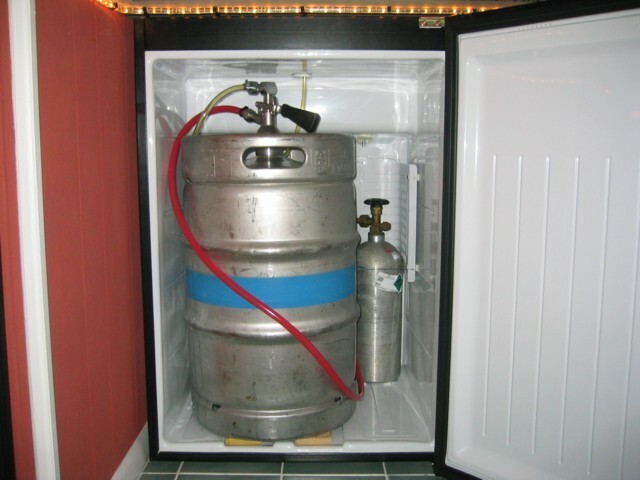 Once you know where to get the keg from, you need a Kegerator to keep it in. 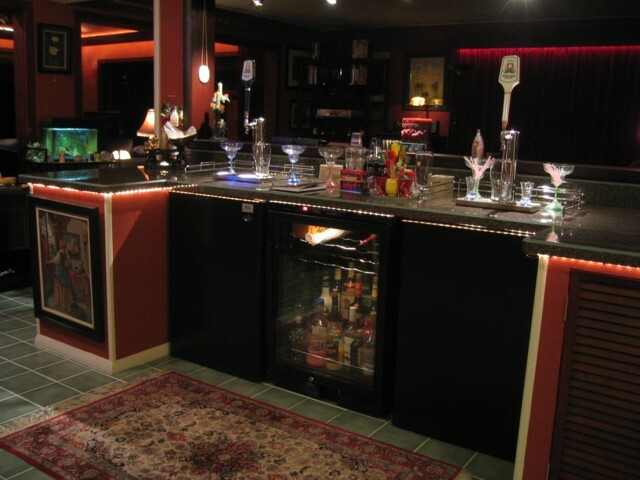 Some people build or convert their own out of an old refrigerator or you can buy a purpose built appliance. 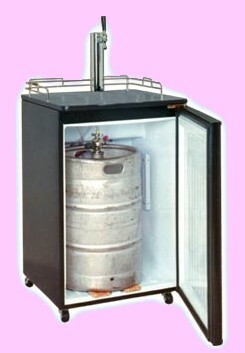 I decided to buy a Kegerator from Micro Matic. Its a Sanyo BC-1206 and I have two of them now. They cost about $645 plus shipping. As you can see, it is basically a refrigerator except the compressor is at the top. This is so that the bump on the inside is not in the way of the keg which you can see just about fills the entire thing. This is in fact a half keg and it contains 90 English pints. When it is full, I can just about lift it. To get it from the truck to the house requires a dolly, err, I mean a barrow. Next you need a coupler. In Germany they use a special type of sliding coupler, so you need to make sure you have the correct one for the type of keg you have. The standard American Sankey coupler will not fit on a Spaten keg. Next you need to get the CO2 gas tank filled. Basically you need to find your local welding or gas supply shop. The Sanyo BC-1206 comes complete with one 5lb cylinder and it is a good idea to have a filled spare ready. You can get that from the welding shop too. I found that my nearest gas supplier is Valley National Gas in Easton (410) 820 7927. It costs about $20 to fill the tank and it lasts for about 4 or 5 half kegs. Now you just need to connect everything up! 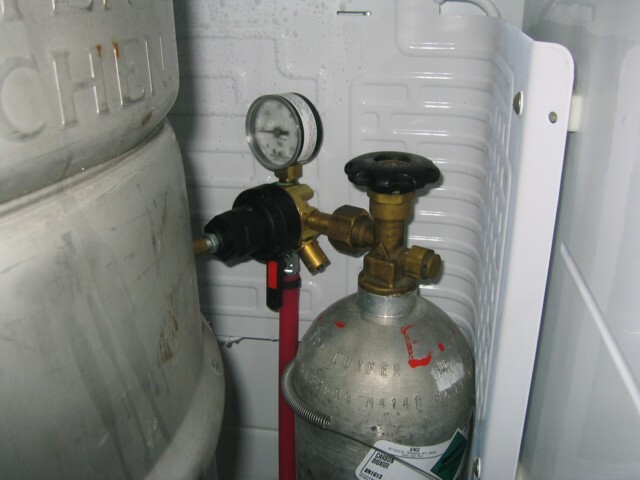 The gas pipe fits onto the tank via a regulator. The Sanyo BC-1206 comes with a standard single gauge regulator and this is quite adequate. Some people like to have a twin gauge regulator so that you can also see the pressure inside the tank so that you have some idea when the gas is going to run out, but you would have to keep on checking it and when it gets low, still the only thing you can do is change the tank , so I think that's a waste of time. You don't get much warning anyhow and if you have a spare tank, it's quick & easy to change it over (even half way through pulling a pint!). The gas tank fits in behind the keg, so there are no pipes showing. There is also room at the front for a spare tank of gas. The other end of the gas pipe fits onto the coupler via a non return valve. 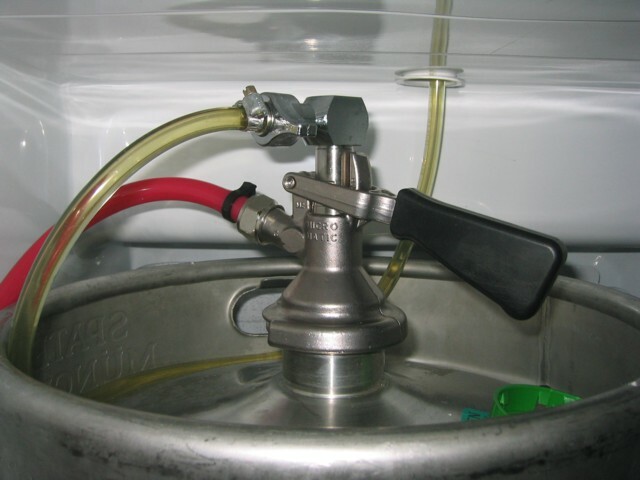 As the beer comes out, the gas goes into the keg, to keep the pressure up and keep the beer fresh. I usually set the regulator to 8lbs. 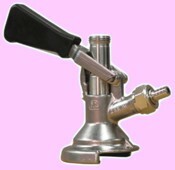 Then the beer pipe from the tap goes onto the top of the coupler and you're ready to tap the keg! 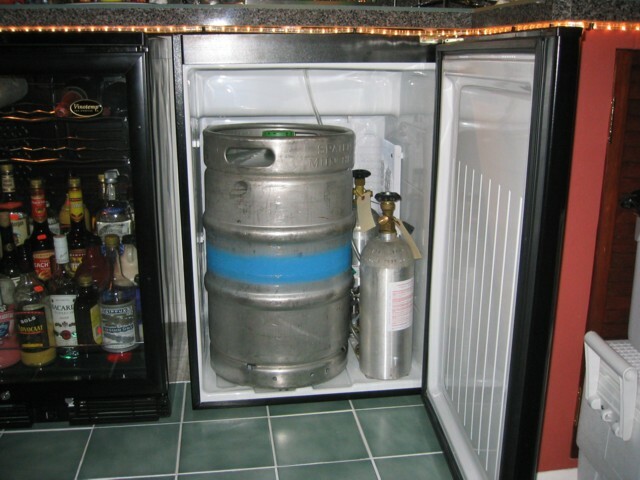 Turn the gas on, slide the coupler onto the keg & press and lock it down. 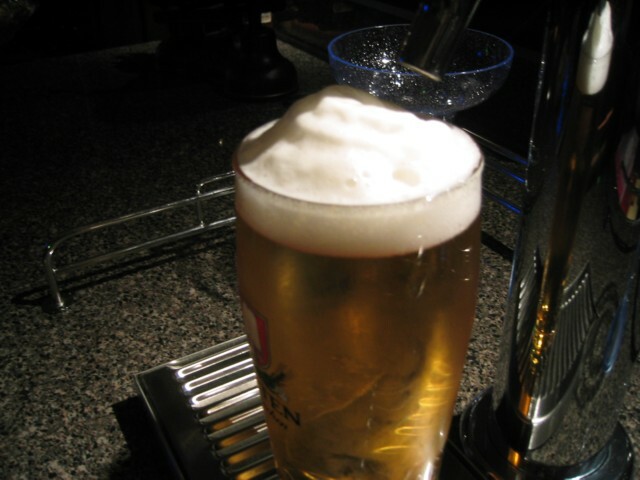 Now you're ready for your first pint of bliss with no headache (unless you drink all 90 pints at once)! Notice that I have a 90o elbow fitting added to the top of the keg tap to give a little extra room as the German sliding coupler is a little taller that the regular American Sankey one. I think the beer will keep fresh for months, however it always seems that the keg runs out by the end of the second month. Each time the keg is changed, I clean all the pipes, the tap and the coupler with a coil ceaning solution. This is to prevent bacteria and yeast from growing in the pipes and making the beer taste bad. This is a bit of a chore & rather like looking after a tropical fish tank, but it seems to work out ok and is better than offering a guest a supposedly perfect pint only to find out the beer is bad! Some people also say that you should take extra special care when washing out the glasses. Keep them away from any food fat and never put them in the dish washer etc. So I wash them up in a separate bowl and leave them to drain and I haven't had any problems. 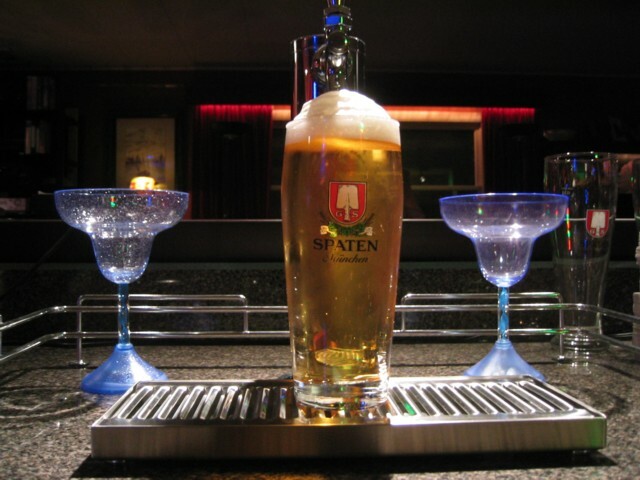 As far as getting proper Spaten glasses and tap handles, I've found that eBay is the best place to find such things. I have two sets of different glasses, two tap handles and a bunch of coasters. They look great! Well after all this hard typing, it's beer time now! Guess what I'm going to have? Please give the video time to load! If you see black, it means it is still downloading!